Wooden rustic chairs hold the pirate hats. Once again, all these photos were taken by Erin Hession Photography. I love how Erin made these novelty plastic coins look good. Custom Jack Sparrow Rum Bottles. Here is a wide shot of the table. The mast in the background was originally going to be placed on top of the table as a centerpiece but the ceiling was low so it became a background prop. This entry was posted in pirate party, pirate ship centerpiece on February 22, 2010 by Setting the Mood. Heave Ho Ye Land Lovers! Come aboard our pirate party/buccaneer bash. This is a table we created for a local tablesetting show this weekend. The “bones” plates were the inspiration. The booty consisted of pieces of eight, jewels and gold treasures. 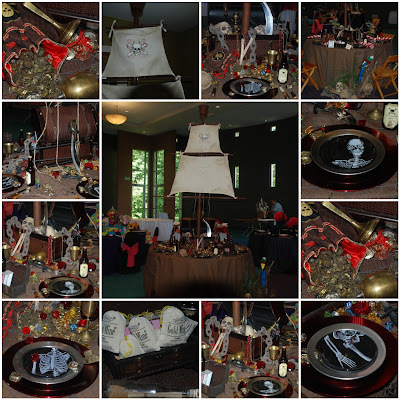 The centerpiece was a treasure chest and a mast complete with the jolly roger and crows nest on top. Custom “rum” root beer bottles served as glasses. The tablecloth topper was netting and the chairs were rustic wood rental chairs with pirate hats hanging off. Yo Ho Ho All Ye Lad’s and Lassie’s! This entry was posted in pirate party, pirate ship centerpiece on August 26, 2009 by Setting the Mood.